Get to know us and see how our individual specialties can help you. At Park Press Printers and Direct Mailing, our focus is on total customer experience. Our team is dedicated to giving our clients value for their money; we offer the best printing and mailing service, adhere to the highest quality, uphold industry’s assurance standards, and provide the greatest client satisfaction on every project we tackle, regardless of size or quantity. We are on top of our game and we continually integrate new technology and recent best practices into our methods and processes. Blending new age digital technology with industry-forged technology, we apply our craft and skill and combine this mix into the design and delivery of a standard, high-quality final product. Our focus on-the-job is on; quality, consistency, creative difference and innovative artistry. Our team understands the need for difference and everyone goes all out to make THAT difference. Our corporate culture encourages a strong work ethic, with employees taking pride and ownership in every job they handle. Precise professional attention goes into the quality and detail to guarantee superior outcomes. Our skilled team consists of account reps, designers and press techs. Together, we believe that when we exceed clients expectations, everyone benefits. Meet Our Leadership Team. Gabriel took over Park Press Printers in 1993. Through years of hard work he has transformed the company into a one of a kind print and mail solution that produces exemplary work while staying ahead of the curve.Gabe’s personality rings through the halls of our small office and really adds to the deep character of the company. Customers of ours have happily become accustomed to Gabe’s lighthearted and yet passionate attitude while working on their projects, which he then tackles with an understanding and intensity that consistently yields winning results time and time again.Originally from an engineering background, his knowledge of all avenues of printing and his ability to think outside the box has made him a leader in the print industry, giving you the most quality and versitile services on the market today. 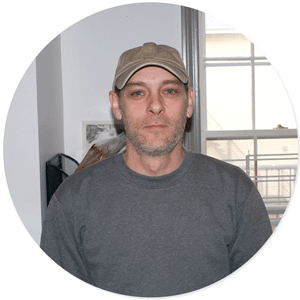 Through the years, Gabe has hand picked an ensemble of knowledgeable and flexible employees. By working one on one with each of them, exchanging valuable ideas and passing wisdom down truly has structured the company in a unique way. In the small amount of time that Gabe is not working, he is mountain biking, skiing, hiking and spending time with his family. Billy has a lifetime experience in the print industry and his knowledge of the new and old world versions of the craft has been indispensable over the past 7 years at Park Press. 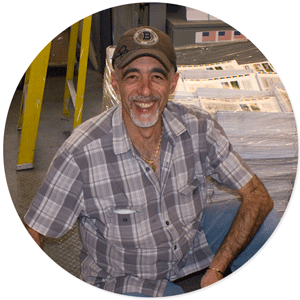 He started prepress while working for his father’s business when he was only 13 years old, when negatives were used to make plates, and text was set by hand.As the prepress and technical guru here, Billy takes on a lot of responsibilities such as preflighting and getting your files ready for print, clarifying and guiding you through your order, managing plate output and updating servers and software. Through swift and thorough execution, he keeps the wheels turning at a steady pace here, and seems to always have the right answer to pretty much any tech question you could have.Billy’s hobbies and interests include playing blues and rock guitar, as well as sound engineering and recording. 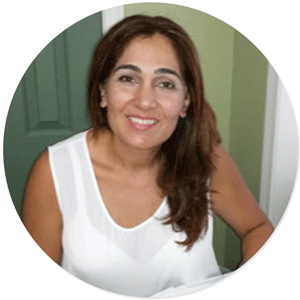 Tania is a big part of our finance department here at Park Press. She is our book keeper and she keeps things in line in terms of making sure vendors get paid promptly and on time, while keeping our dollars organized and all going to the right place.We and our vendors have great relationships, which is why we can work so in sync with them, creating a better and more flexible service environment for you. There are a lot of moving parts when it comes to printing in terms of supplies – ordering paper and ink on a daily basis, or custom parts for our presses to name just a couple. Tania makes sure all of this goes smoothly.Tania is also the loving wife of Gabe, the president of Park Press, and loves spending time with and taking care of her family. 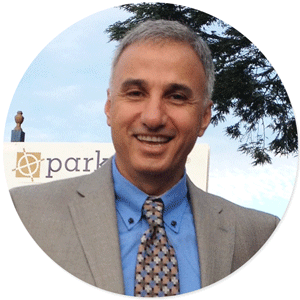 Besides being a commercial printer, Park Press is also a full service mailhouse, and Brian Ardolino is at its helm. 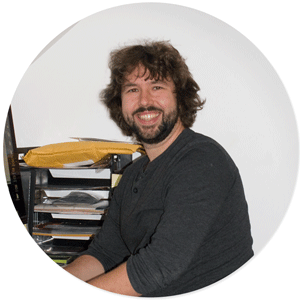 Brian started at the company in 2012 and has been assisting clients and coworkers with all of the necessities of direct mail. Working with state of the art direct mail marketing software and in conjunction with the US Post Office, Brian can walk you through the process – creating or processing your mail list, addressing your mailers and prepping them for the post office, all while getting you the lowest postage rates possible.Brian also mans our digital press. 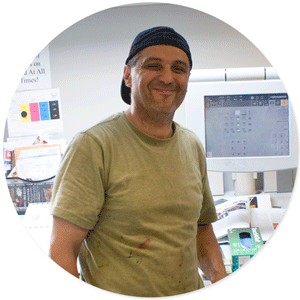 With his keen eye for detail and quality control, he will make sure your digital print jobs turn out perfectly. These skills mixed with a technical prowess for design, and the ability to assist with bindery and other job finishings make him a valuable asset to the team.In his free time, Brian enjoys painting, playing music and experiencing the great outdoors. Kevin joined Park Press in 2015. You can find Kevin working with customers, maintaining the website, or running digital print jobs, binding, or assisting with mailing. When he’s not working, Kevin is playing music, making art, enjoying the great outdoors or finding new things to learn. Omer is the man. Always willing to help out with whatever you need, Omer’s effort, knowledge and attitude make Park Press a better place to work.Omer mostly works in the press room, and his production skills are unmatched, whether he is cutting paper, binding booklets, die-cutting, letterpress printing, or working the folder. He also is the person who expertly packages up all of our finished work to be shipped to our customers, sometimes even delivering them by hand. He does it all in and out of the press room!Originally from Zalhe in Lebanon, Omer is fluent in Arabic, English and French. He began work at Park Press in 1997 and helped build it from the ground up, to become what it is today. His range of skills have secured superior quality in our work for the past 17+ years. Tommy’s presses are the busiest in the building, so Tommy really keeps business here booming. 1 and 2 color work makes up the majority of our stationery jobs (letterhead, business cards, envelopes), and is an important part of our business model. 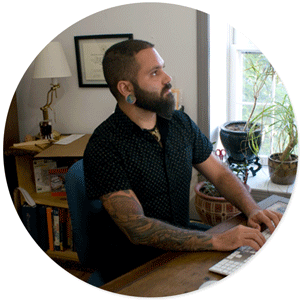 Tommy helps bring these jobs to life by meticulously matching exact Pantone ink colors, making small adjustments on the press, and in the end crafting beautiful offset printwork on an array of quality paper stocks. The character of a good offset print heavily depends on the pressman that’s printing it, and Tommy consistently shines while turning out Park Press’ signature forte of press work.He’s not all business however, off the press he’ll be laughing and joking around with everyone at the office, providing some much needed flavor to the sometimes hectic print shop schedule. His interests include spending time with his family, barbecuing and attending Lebanese-American functions. 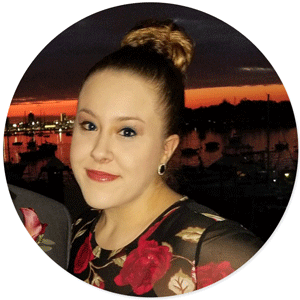 Stephanie, our newest member joined Park Press in October 2017. Stephanie is the first face that most people see as they walk through the Park Press doors and she’s also likely the first person you’ll be speaking with if you give us a call. In between her friendly greetings, she is working to familiarize herself with all aspects of the shop so that she can deliver an excellent customer experience for both park press clients and vendors. In her free time, Stephanie enjoys spending time with her family, traveling with her fiancé and taking pictures of the places they visit. You may be greeted by Autumn when you come in for a visit! 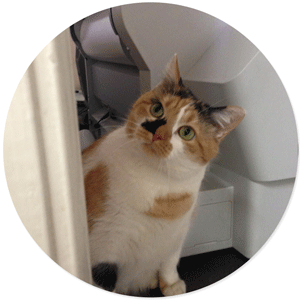 Autumn the cat is our beloved mascot and can be found sleeping, greeting clients, or knocking papers off of the many desks we have here. She is super friendly and would love to meet you. Park Press is a company built on history. Founded in 1934, the historic building that is home to Park Press Printers was erected in 1836 as a church that was converted to a general store and later became the Saugus Center Post Office. From its humble early beginnings as a letterpress shop in the basement of a home on Park street (hence our name), Park Press Printers progressed and expanded to include direct mail and a full range of commercial print services to meet all printing and marketing needs. Today, we are a fully licensed and fully operational Union Printing and Direct Mail Company located just outside Boston in the Saugus, Massachusetts. Park Press is a Value-Plus, Savings-Plus company. We always add value to our clients across board and every Park Press client knows that we are Dependable, Affordable and We Make Life Easier! Our technologically sophisticated and multi-faceted printing and mailing company is fitted with resources that deliver more value at a faster rate and for less money. Our clients see us as the ‘go-to’ company. You will too. We guarantee it. Our target clients are ones we can build mutually benefitting relationships with. At Park Press, anyone and everyone is welcome to join our growing family. As an all-in-one shop, we cater to virtually any printing need and as the business-client relationship grows, clients realize that we go all out to ensure that their happiness comes first.